Dr Guillaume De Bo (left) presenting the ChemComm prize to Alexander Elmi (right). ChemComm was proud to sponsor this successful symposium. 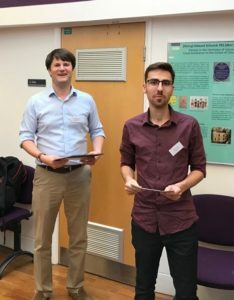 Alexander Elmi (University of Edinburgh) received the ChemComm poster prize for his poster entitled ‘Understanding Aromatic Stacking Interactions In Solution’. Congratulations Alexander from everyone at ChemComm! Since July 2017, ChemComm has been running an experiment; offering authors a choice on how their manuscript is peer reviewed. 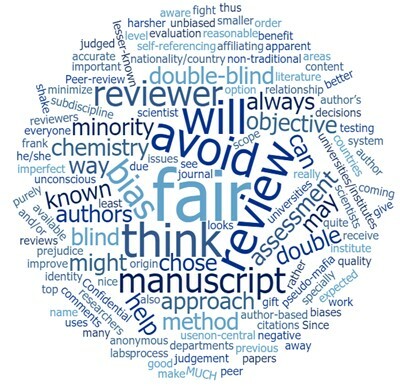 Authors have had the option to choose between the customary ‘single-blind’ peer review, where reviewers remain anonymous while knowing who the authors are or choose to keep their identity from reviewers, who will assess the work without knowing who the authors are – i.e., ‘double-blind’ peer review. 12 months on, as our experiment comes to a close, we want to share some of our findings, which have led us to decide to keep optional double-blind peer review on ChemComm. Over the last 12 months, 10% of ChemComm authors chose the double-blind option at submission. In line with data published in the Peer Review Congress abstracts1, authors from India and Iran had higher than average uptake, whereas USA, Japan, Germany and the UK all showed less than 5% uptake. During the trial we gathered feedback from authors to understand their motivations for choosing either single- or double-blind peer review. We found that those who chose double-blind, perceived this option to be more fair and all said they would choose it again next time they submit. Those who opted for single-blind peer review did so because of familiarity with the process, with a small proportion saying they would chose double-blind next time. Authors are responsible for anonymising their own manuscripts, and we found that a significant portion of manuscripts were not fully anonymised, in many cases due to author and/or affiliation details being present in the main article. This is something we want to explore further to see if there are actions we can take to increase the proportion of manuscripts that are fully anonymised. If you do want to choose double-blind peer review for your submission, guidelines for successfully anonymising your manuscript can be found in our handy checklist along with more detailed guidelines for authors and reviewers. Overall, our findings suggest that the quality of the reviews received was comparable for both single- and double-blind review and author satisfaction levels were also equal for both. 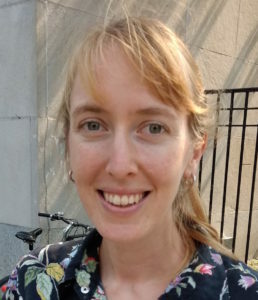 Although it is unclear at this stage whether double-blind peer review truly reduces bias during the peer review process, it has been clear to us that there is strong advocacy for it from some members of our community. Therefore, we want to continue offering our authors at ChemComm a choice and therefore the option to choose double-blind peer review will remain as a permanent feature. We continue to welcome your comments and feedback and encourage you to try double-blind peer review for your next submission. 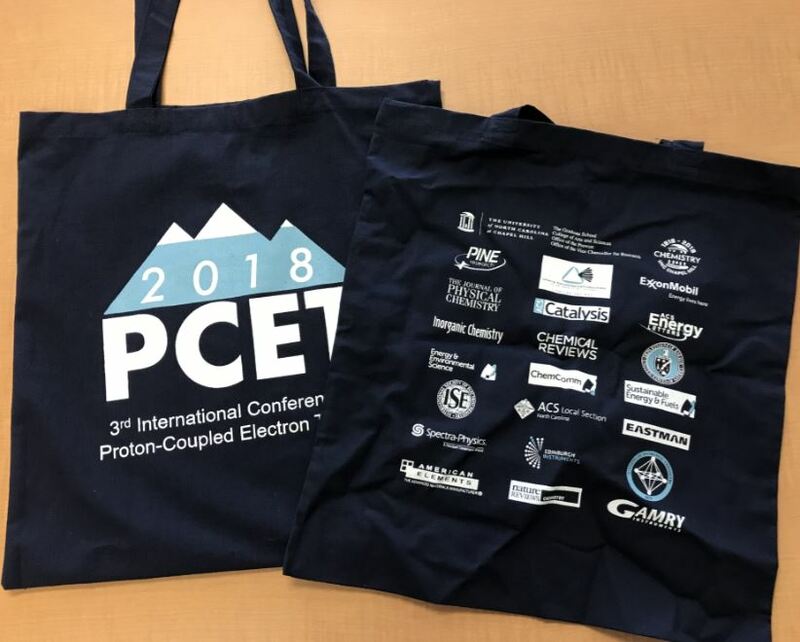 The 3rd International Conference on Proton Coupled Electron Transfer (PCET) was held recently from 10 – 14 June in Blowing Rock, North Carolina, USA. The meeting was a great success and one that ChemComm was very happy to support. There were 128 attendees overall included attendees spanning 15 countries. The topics of the 81 posters and 34 talks presented covered all areas of Chemistry, one of which was presented by Ken Sakai, Kyushu University and sponsored by ChemComm. The 4th PCET meeting will be held in 2021 in Catalonia, Spain, and will be hosted by Toni Llobet. 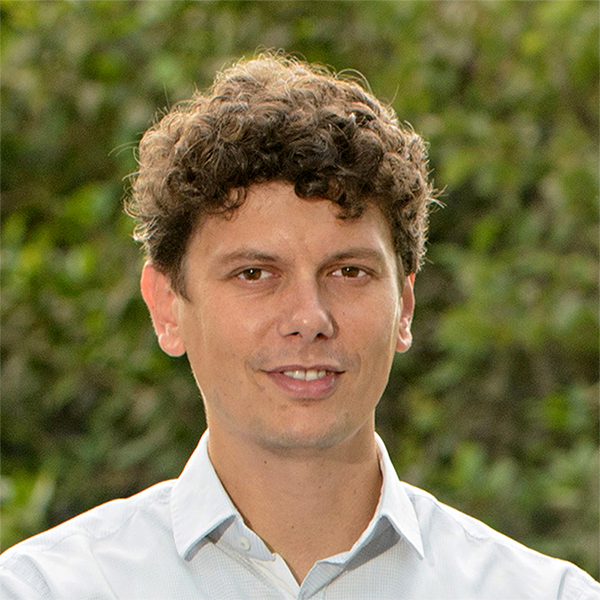 We are delighted to announce that Dr Rafal Klajn, winner of the ChemComm sponsored 2018 Cram Lehn Pedersen Prize, will be giving a series of lectures at UK universities during the week commencing 16th July 2018. As part of the Prize, Rafal presents 3 lectures and we are delighted to announce that 2 of these will be taking place during his UK tour. He will be giving these in conjunction with lectures for the 2017 Chem Soc Rev Emerging Investigator Lectureship that was also awarded to him. You can find details for his upcoming UK tour below. A team of researchers from Shandong Normal University in Jinan, China, have developed a highly sensitive and label-free assay for the detection of uracil-DNA glycosylase, a DNA repair enzyme that removes uracil from DNA molecules. Uracil is an RNA base, and when uracil appears in DNA through deamination of cytosine or misincorporation during DNA synthesis, the error can have mutagenic consequences. Diminished activity of uracil-DNA glycosylase has been linked to a number of disease states including human immunodeficiency and Bloom syndrome, an inherited disorder associated with an increased risk of cancer (among other symptoms). Developing sensitive methods to quantify uracil-DNA glycosylase would enable early diagnosis of such conditions and improve understanding of the DNA-repair machinery. As a proof-of-concept, the researchers showed that this method could quantify the enzyme in the cell lysate of HeLa cancer cells. Their method reminds me of Rube Goldberg machines, which achieve a task via a series of connected, mechanical steps. Completion of one step triggers the start of another: such as a line of falling dominos hitting a marble that, in turn, rolls down a track. In this work the action of one enzyme returns a product that is the preferred substrate of another enzyme. At the risk of deviating slightly, one of the more spectacular examples of a Rube Goldberg machine is seen in the music video for OK GO’s ‘this too shall pass’, a single-take shoot of a warehouse sized machine, featuring rolling cars, swinging pianos, flowing water and rolling billiard balls, all to perform the task of (spoiler alert) blasting the band members in the face with coloured paint. The authors’ strategy involves a series of sequential steps employing seven different enzymes and three nucleic acid probes. It begins with a double stranded DNA probe containing one rogue uracil base: the perfect bait for uracil-DNA glycosylase. 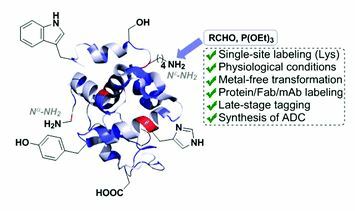 The action of this enzyme and two others, in a process involving base excision, DNA backbone cleavage and the addition of thymine-rich sequences, produces a large quantity of single-stranded DNA molecules with long thymine-rich tails. These molecules hybridise with adenine-rich RNA probes to generate RNA-DNA duplexes. An enzyme digests the RNA portion, releasing adenosine monophosphate monomers, which are converted to adenosine triphosphate (ATP), a required energy input to activate firefly luciferase. Luciferase catalyses the oxidation of luciferin to form oxyluciferin, accompanied by a large bioluminescent signal. Thus, uracil-DNA glycosylase is detected with 1-2 orders of magnitude more sensitivity than state-of-the-art fluorescent and luminescent assays. Unlike conventional Rube Goldberg machines, which are characterised by unnecessary complexity, in this ‘enzymatic Rube Goldberg machine’ each step has a specific purpose and serves to amplify the signal of the last. This is dubbed ‘tricyclic cascade signal amplification’ and it enables highly sensitive detection of the enzyme. Yan Zhang, Qing-nan Li, Chen-chen Li, Chen-yang Zhang. All of the referee-recommended articles below are free to access until 3rd August 2018. The 16th Symposium for Host-Guest and Supramolecular Chemistry was held on 2 – 3 June 2018 at the Tokyo University of Science in Japan. This annual symposium covers all aspects of the chemical sciences related to molecular recognition and supramolecular chemistry, including the discussion of topics around intermolecular interactions. The event included a special lecture by Dr Shigeki Sasaki and invited lectures by Dr Takashi Hayashi and Dr Katsuhiko Ariga. ChemComm is delighted to announce that the ChemComm poster prize was awarded to Hiroshi Koganezawa from the Tokyo University of Science for a poster entitled ‘Synthesis of Rotaxanes with Spirofluorene and Pyrrole Moieties’. Well done Hiroshi from everyone at ChemComm! Synthesizing nanomaterials consisting of two-particle pairs, or dimers, is no longer a headache. Hongyu Chen and coworkers from Nanjing Tech University, China recently developed a protocol that can produce gold dimers with a record high yield. 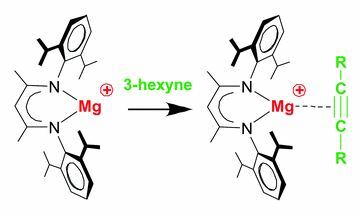 This breakthrough is published in Chem. Commun. Dimers are suitable platforms to study the effects of particle-particle interactions on the electrical and optical properties of the constituent materials. Unfortunately, no conventional synthesis methods to exclusively produce dimers from single particles have been successful. 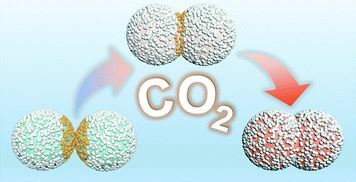 This is because of the uncontrollable particle-aggregation rate that leads to the formation of multi-particle clusters. Therefore, how to couple single particles into dimers without triggering their further aggregation has become a tough nut to crack. Chen and coworkers found a solution by developing a polymer-assisted method that generates gold dimers with high yield. Firstly, they encapsulated individual gold nanoparticles with polymer shells made of polystyrene-b-poly(acrylic acid). Under optimized conditions, the gold nanoparticles were mostly coupled into dimers (Figure 1), achieving a dimer yield of 65%. This is the highest dimer yield achieved for one-step synthesis methods. Figure 1. (a) A transmission electron microscopy (TEM) image of the polymer-encapsulated gold single particles. 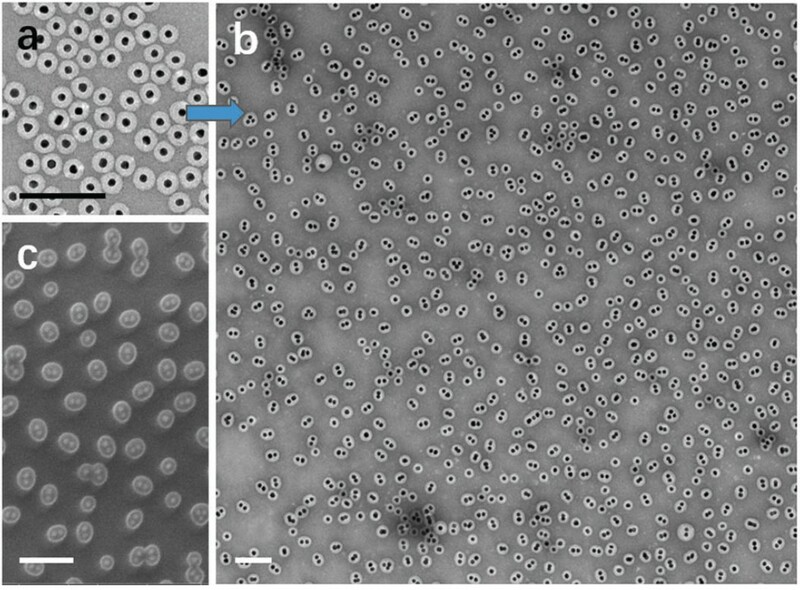 (b) A TEM image and (c) a scanning electron microscopy image of the synthesized gold dimers. All scale bars are 200 nm. The key to this success is due to three factors: temperature, solvent composition and acid concentration. All these factors can change the strength of the repulsion force among the polymer shells. The force must be meticulously tuned to a level that is weak enough to induce 1-to-1 coupling, but strong enough to prevent 1-to-multiple or multiple-to-multiple aggregation. 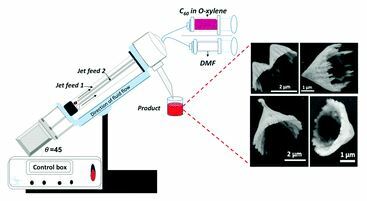 Through a set of control experiments, the authors identified the optimal conditions to be 60 oC, dimethylformamide/water (v/v)=6:1 and 5 mM of hydrochloric acid. The method demonstrated herein could be extended to other particles. 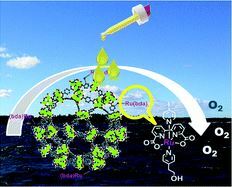 It may also inspire versatile synthesis strategies towards complex nanostructures with high selectivity. Tianyu Liu obtained his Ph.D. (2017) in Physical Chemistry from University of California, Santa Cruz in the United States. He is passionate about scientific communication to introduce cutting-edge research to both the general public and scientists with diverse research expertise. He is a blog writer for Chem. Commun. and Chem. Sci. More information about him can be found at http://liutianyuresearch.weebly.com/. The 2018 European Materials Research Society (EMRS) Spring Meeting was held from the 18th – 22nd June in the Strasbourg Convention Centre in France. The EMRS Spring Meeting is the society’s major conference and covers all aspects of materials science including energy and environment, biomaterials, semiconductors, nanomaterials, functional materials, and materials processing and characterization. 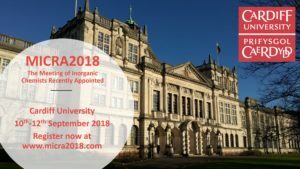 It offers on average 25 topical symposia and is widely recognised as being of the highest international significance, with approximately 2,500 attendees every year. 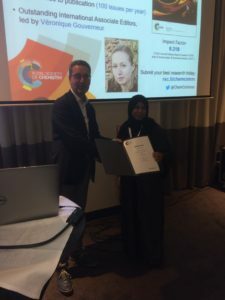 ChemComm is proud to announce that the ChemComm poster prize was awarded to Dr Manal Alkhamisi from the University of Nottingham (School of Physics and Astronomy) for ‘The Growth and Fluorescence of Phthalocyanine Monolayers and Thin Films on Hexagonal Boron Nitride’. Manal was awarded the prize by ChemComm Associate Editor Steven De Feyter.